It party time! Come celebrate the Carnaval season all year long with 360 Skin Care's Brazilian Extravaganza Collection. It time to take your body on a voyage to the biggest celebration south of the equator. 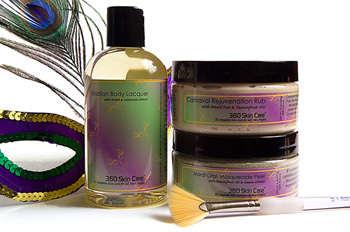 Enjoy our nourishing Brazilian Body Lacquer, our exfoliating Carnaval Rejuvenation Rub and our Mardi Gras Masquerade Peel all bundled together to create your own celebration.Our bundled collection gives you a savings of 5% of purchasing each product individually. All for $69.30!! That is a savings of $7.70!